Want to know more about the team behind this book for big brothers and sisters? They say it takes a village to raise a baby … It also takes a village to make a book! Read on for more about the team behind this book for big brothers and sisters! 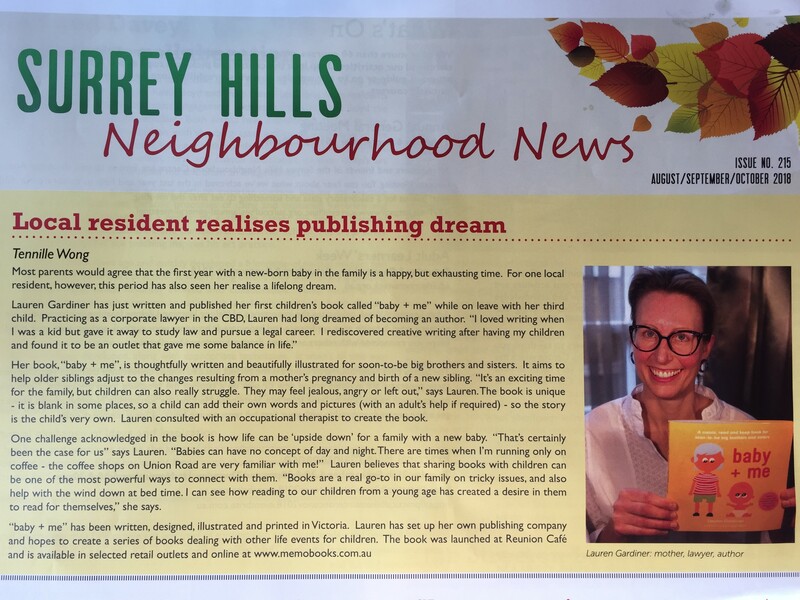 Lauren Gardiner – author of the baby + me book for big brothers and big sisters. Grace West – illustrator and designer of the baby + me book for big brothers and big sisters. Debbie Isaac – paediatric consultant to the baby + me project. Lauren Gardiner, the author of baby + me and creator of me mo books. Lauren lives in Melbourne with her husband and three young children. The concept of baby + me was developed by Lauren while waiting for her youngest child to be born. Read more about Lauren here. Grace West, the designer and illustrator of baby + me. Grace is passionate about illustrations, books, typography and print design and can’t wait to be a mum! More information about Grace can be found at gracewest.com.au. Debbie Isaac, paediatric specialist consultant to the baby + me project. Debbie lives in Melbourne with her family. Kerry Davies (AE), for editorial advice. Tennille Wong, the publicist for baby + me. Adams Print (Fred Mayer), printer of baby + me. And a big circle of friends and family, for consulting services, proof-reading and general support to the baby + me project. Lauren with some of the consultant mums.